The specified file public://inline-images/https_%2F%2Fs3-us-west-2.amazonaws (19)_0.jpg could not be moved/copied because no file by that name exists. Please check that you supplied the correct filename. As of the 2017 City of Chicago Actuarial Report, each Chicagoan would have to pony up $140,000 to make pensions solvent. WirePoints reports Chicago Mayor Rahm Emmanuel wants a Constitutional Amendment to address Illinois Pension Woes. The mayor's plan cannot possibly work because Chicago is far too deep in pension debt to do anything but default. Nonetheless there is some benefit in the idea for the simple reason it may force the legislature to think about things as they are, not as they want them to be. Kudos to Rahm Emanuel for broaching the subject of a constitutional amendment for pensions and for using cost-of-living adjustments as an example of why the amendment is so necessary. The possibility of an amendment in Illinois has experienced a revival of sorts since Arizona recently amended its constitution for a second time. Already, the Chicago Tribune, Crain’s and Mayoral candidate Bill Daley have supported an amendment in some form. And COLAs are finally being recognized as a key driver of Illinois’ pension crisis. However, it would be a mistake – as some may be tempted to do – to think that an Illinois fix is as simple as COLA reforms via a narrow, Arizona-style constitutional amendment. Instead, Illinois needs an amendment that’s as broad as possible if it hopes to fix the pension crises playing out all over the state. 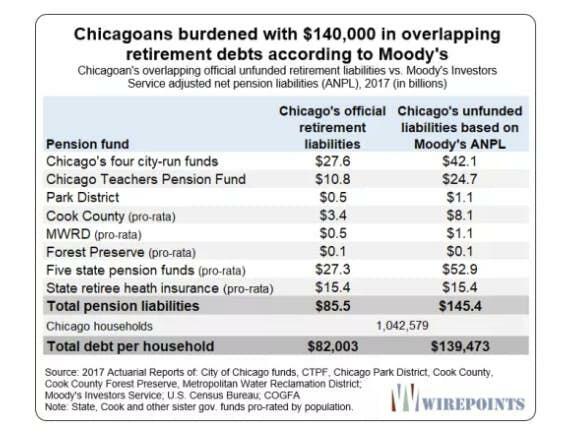 Collectively, Illinois governments owe more than $400 billion in pension debts alone, based on Moody’s most recent methodology. 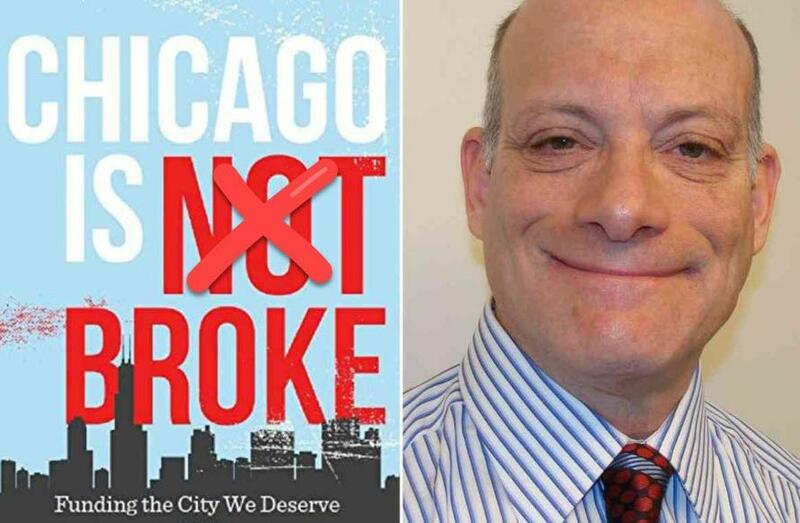 Its a particular problem for Rahm Emanuel, as Chicagoans are the most swamped of all. Each city household is on the hook for $140,000 in overlapping state and local retirement debts. WirePoints discusses changes in Arizona and accurately concludes piecemeal changes won't work for Illinois. Here's a hint, they won't work for Arizona or any other state or municipality either. Ridiculous COLA adjustments are only a tiny piece of the problem. "Any Illinois amendment should repeal the protection clause and say expressly that the state may modify past and future pension benefits notwithstanding the state constitutional contract clause or anything else in the Illinois constitution that might conflict." Of course, Labour unions could and would appeal that, all the way to the US Supreme Court. The process could take years. In Wirepoints’ view such appeals would fail. I have a far simpler approach that is 100% certain to work, and work faster. Q. How does that fix the problem? A. As we have seen in Detroit, Michigan; Central Falls, Rhode Island; and numerous cities in California, pension promises are not sacrosanct in bankruptcy. As it stands, states can allow or prohibit municipal bankruptcies, but if allowed, Federal laws take precedence over state rules. In bankruptcy, pension obligations can be reduced. They were hammered in Central Falls. In Illinois, I would expect the City of Rockford to file bankruptcy the moment it could. Rockford is Illinois' third largest city. Such a bankruptcy would send shock waves through the bond markets, but also where reform is needed most: Illinois pension plans. Bankruptcy reform would put huge pressure on unions to reduce demands in a fair manner (highest pensioners get the biggest cuts), rather than leaving matters to the courts to decide where the cuts happen. Bankruptcy reform would in and of itself likely ensure that the state would get around to fixing, via constitutional amendments, its other pension problems. The advantage of my approach is we would not have to wait for a constitutional amendment. It would come later.